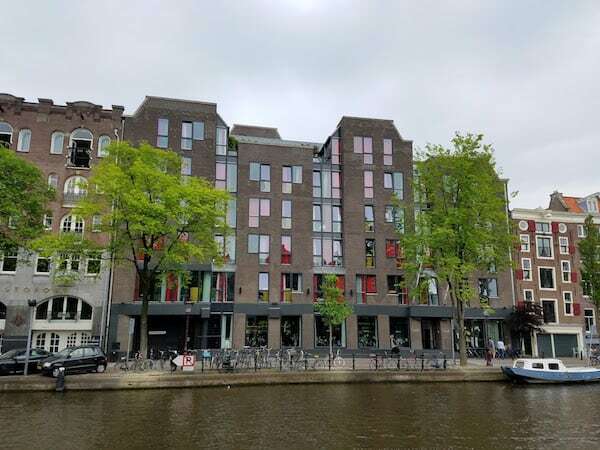 Up until about 4 years ago, there were no Hyatt properties in Amsterdam. 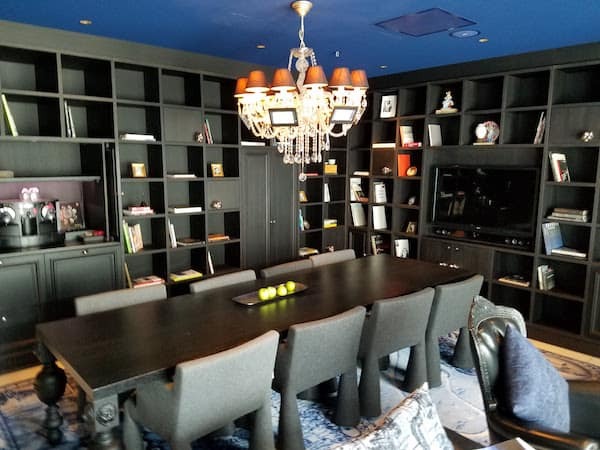 Then they opened the Andaz Amsterdam Prinsengracht in an old library building. Since then they have opened a Hyatt Place at the airport and have plans to open a Regency in 2017. 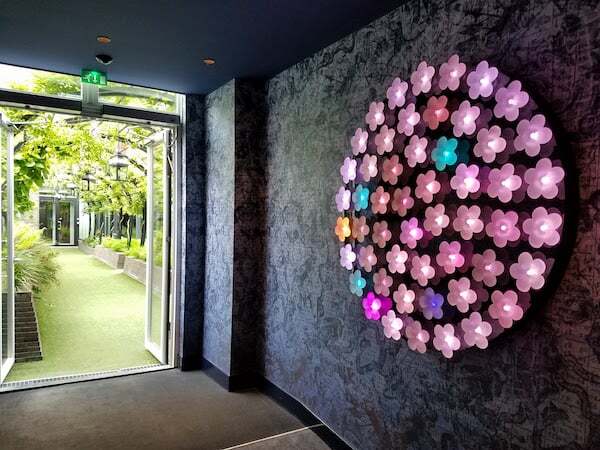 This was to be my first stay at an Andaz property. I was coming over a US holiday (Memorial Day) and would be staying a Saturday and Sunday night. I was a bit shocked by the prices, €400+ per night. 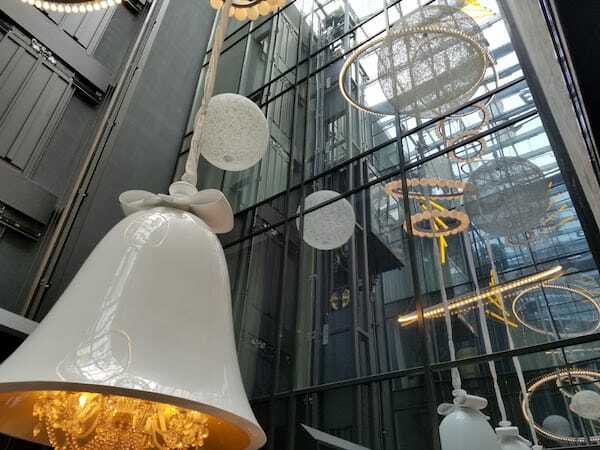 The Andaz Amsterdam Prinsengracht is also notorious for not opening up cash + points space, so my alternative was to pay 25,000 points per night. I used points to pay for my stay. 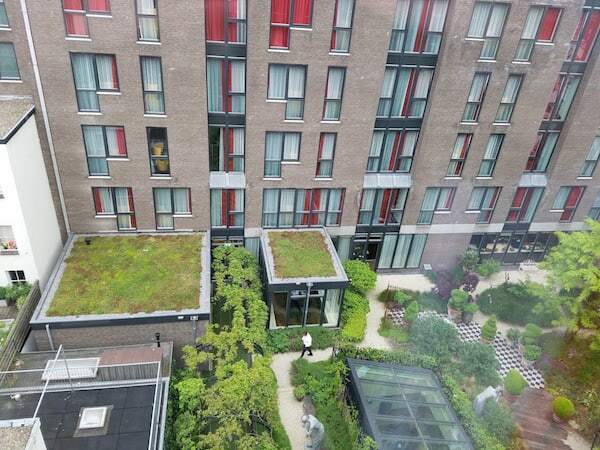 According to one of the staff I spoke with, Amsterdam has about a 30,000 hotel room deficit. 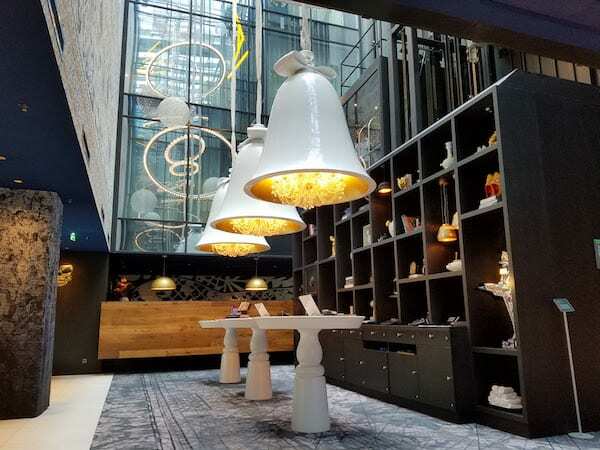 Because of this, the Andaz Amsterdam Prinsengracht is often full in the spring/summer months so no need to entice visitors with cash + point rates. 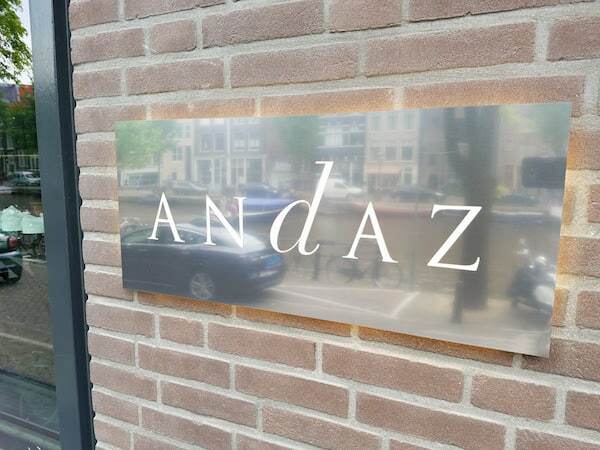 Location: The Andaz Amsterdam Prinsengracht is located directly on one of the canals (Prinsengracht to be exact) in a residential area in the southwest of the city. It is very easy to walk to any/all of the city. Or you can borrow one of the hotel’s free bikes to get around. 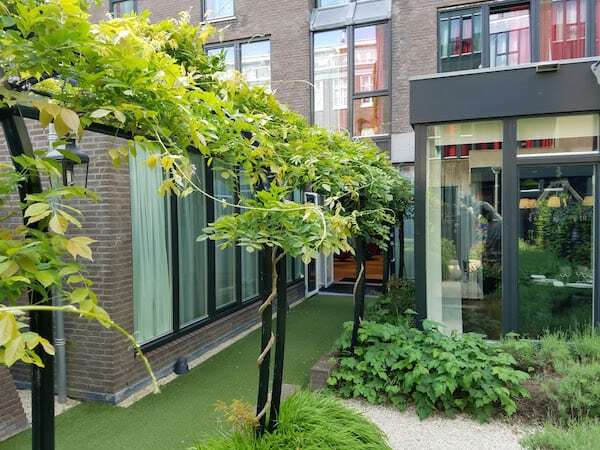 The Anne Frank House is located on the same canal, just a few blocks north. The museum square is about a 15 minute walk south. You do NOT want to have a car in Amsterdam; or even take a ride in a car to be honest. Getting to the hotel you can either take the 197 bus (and then walk a bit) or take the train and street car. Either way you will have to walk a few blocks but saves you the hassle of a taxi or uber that will take a while on the streets that really aren’t made for cars. 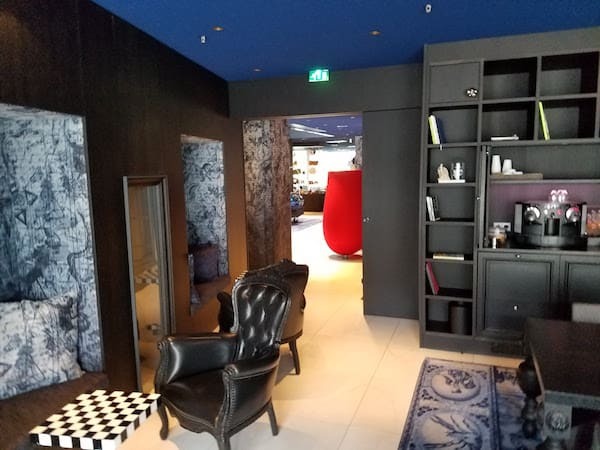 Check In: I was checking in to the Andaz Amsterdam Prinsengracht on a Saturday around 3:00pm and they were somewhat understaffed. I waited a few minutes at their funky check in tables in the atrium and found out my room was not yet ready. 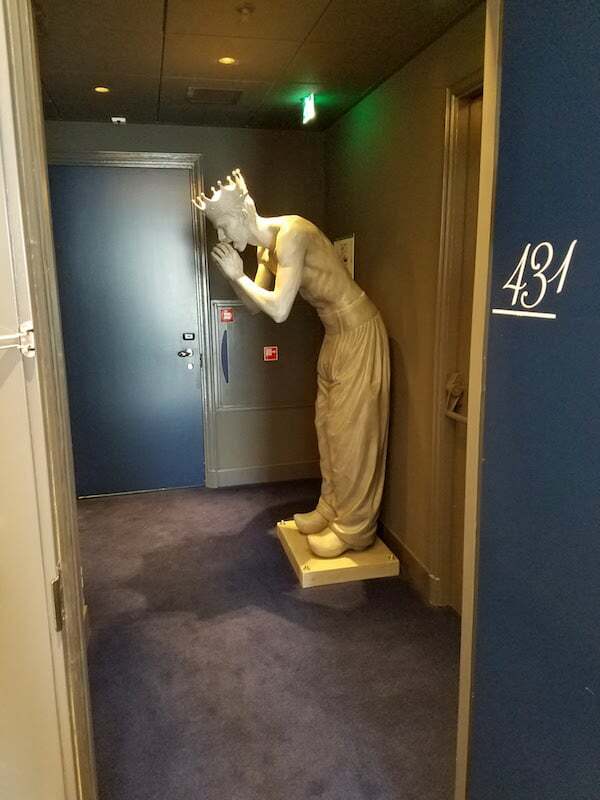 I could have an accessible room on the first floor, but decided it better to wait. It was ready in about 30 minutes so I was offered a bottle of water and was shown the Library (the “family room” of the hotel). 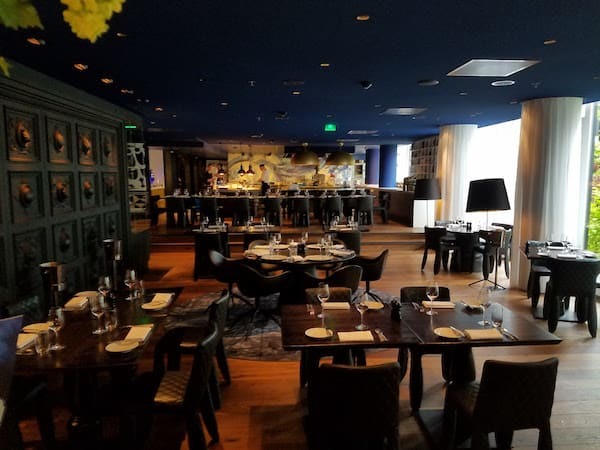 The Library is where the daily wine reception is each night from 5:00-7:00pm. It is a nice area to sit and has a large window out on to the canal and street. 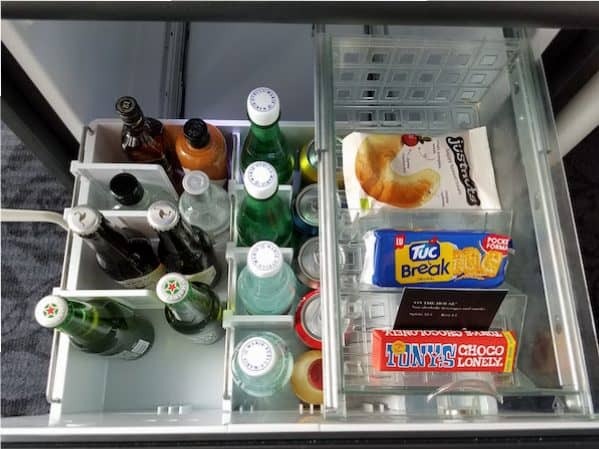 There is also a coffee maker and refrigerator stocked with free water bottles and juices. 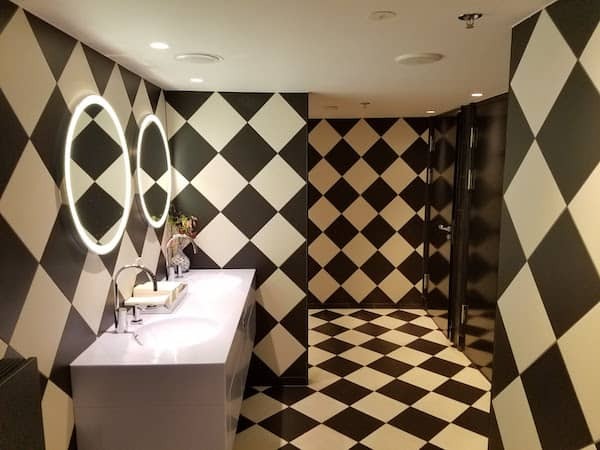 It is the closest thing to a Club, however all guests have access. 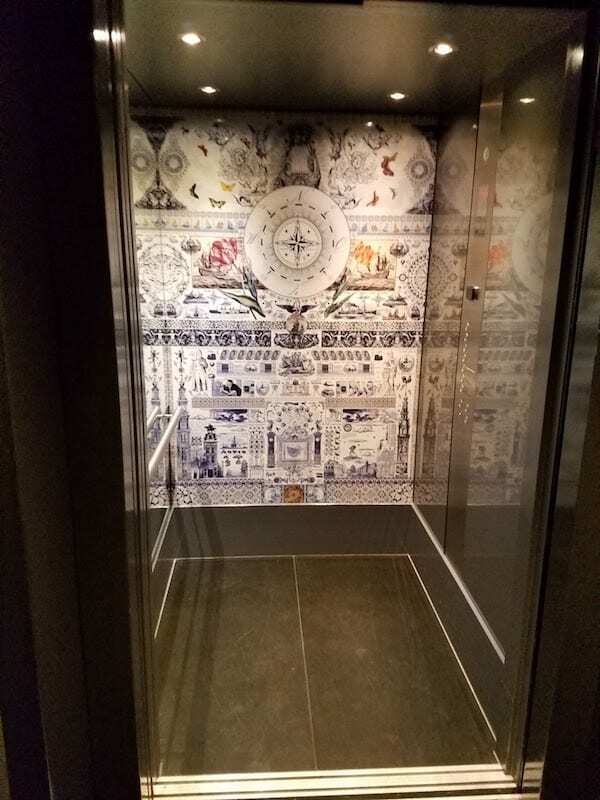 When my room was ready, I was taken to the second building (the Andaz Amsterdam Prinsengracht is actually two separate buildings connected by an underground tunnel where the gym and spa are or through the open air garden). When we got in the elevator, the friendly staff realized he hadn’t made me a key, so he ran back to get it and had me wait in the garden. 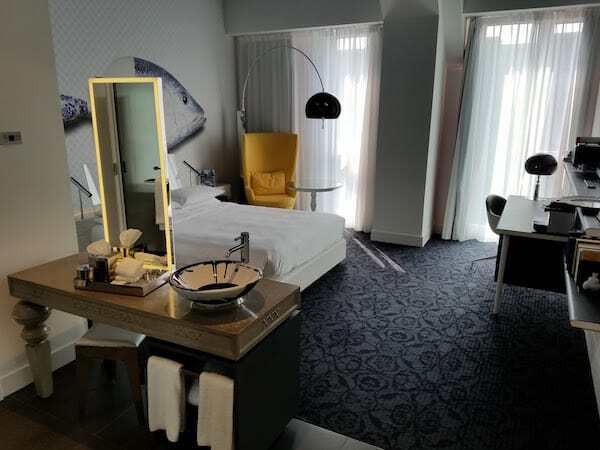 The Room: I was checking in on a Saturday afternoon and, according to the staff, there were only two unoccupied rooms; neither of which were canal view. Instead I received a Garden View King room in the back building. 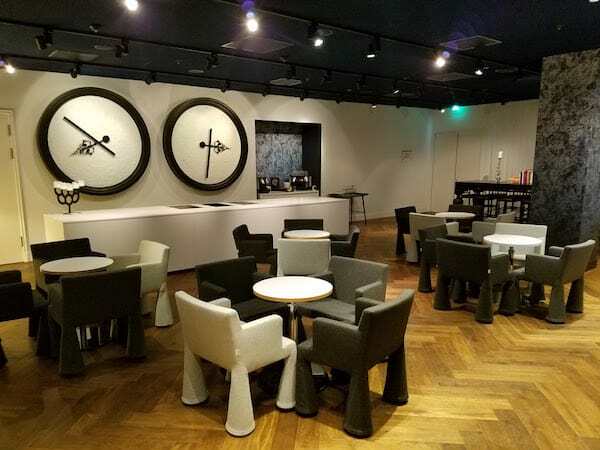 One thing to note; the standard room is an “observatory room”; this means that the room has no windows to the outside but instead have a window into the lobby atrium. 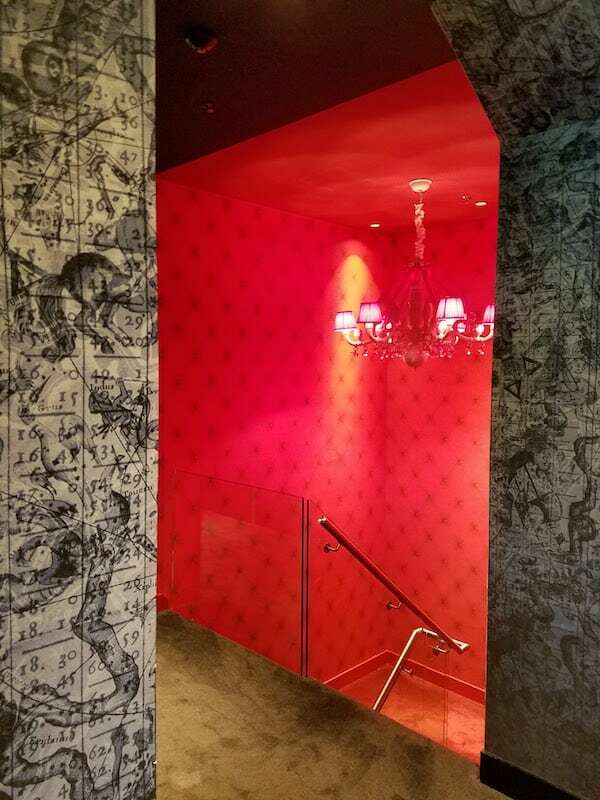 The glass is one way mirrored, so you can see in to the atrium/lobby but other guests can’t see in your room. My room was on the 4th floor (of 5 total floors). The nice thing about the back building is that there are only 4 rooms on each floor so it is pretty quiet. I was in 431 which is a corner room (unfortunately there are only windows on one wall however). 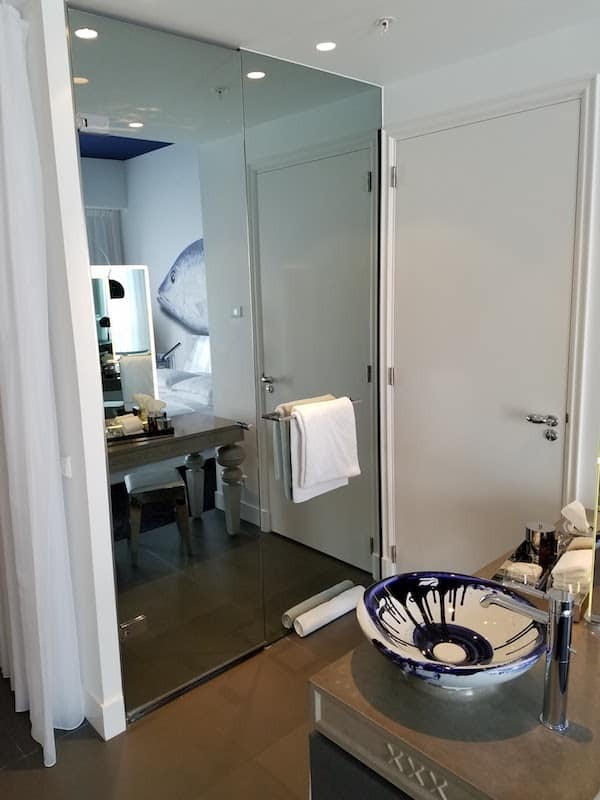 The rooms at the Andaz Amsterdam Prinsengracht are very open which would make it fine for a couple but not good for a family or friends (see my description of the bathroom below). The room had standard features you would expect. 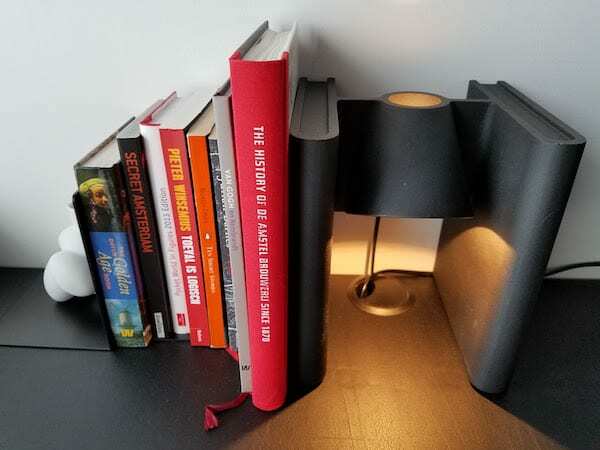 King bed with reading lights on each side. Large sitting chair. 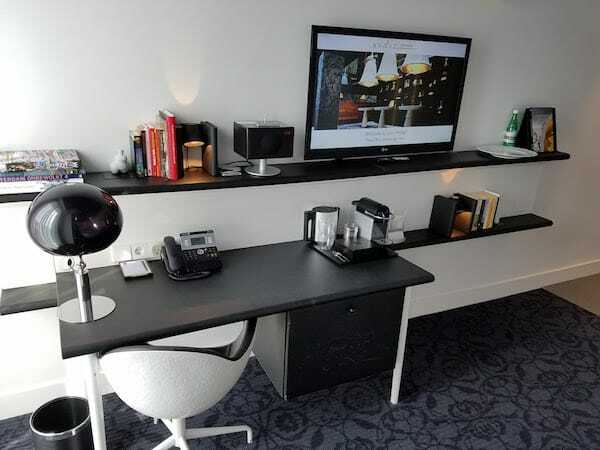 Desk with built in mini-bar. 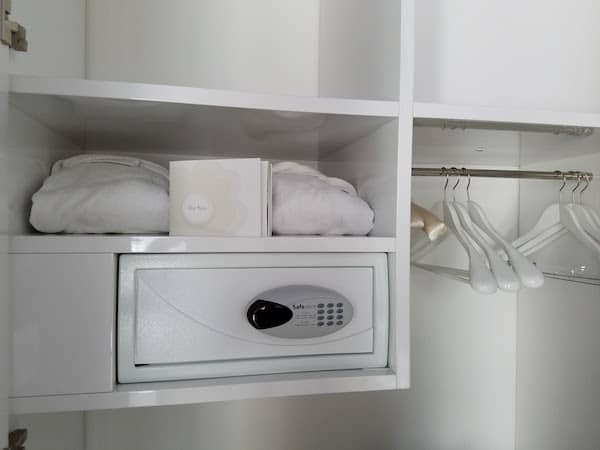 Standard size built in closet with a safe, robes and slippers. The bed itself was firmer than I would like and the pillows less full than I would like. Linens were all bright white and in good shape. 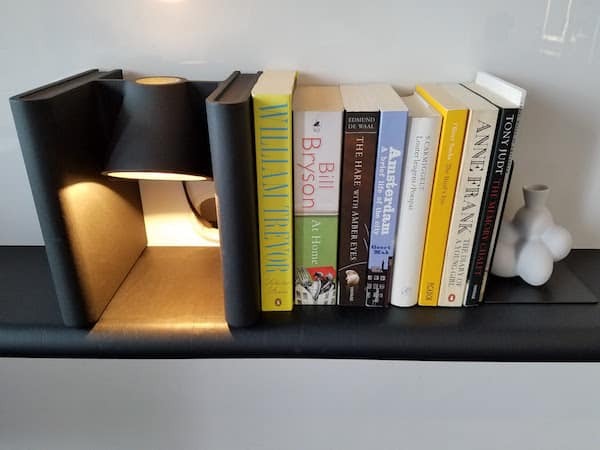 A large wall mounted flat screen was on one wall with a desk under it and built in bookshelves (with books!). 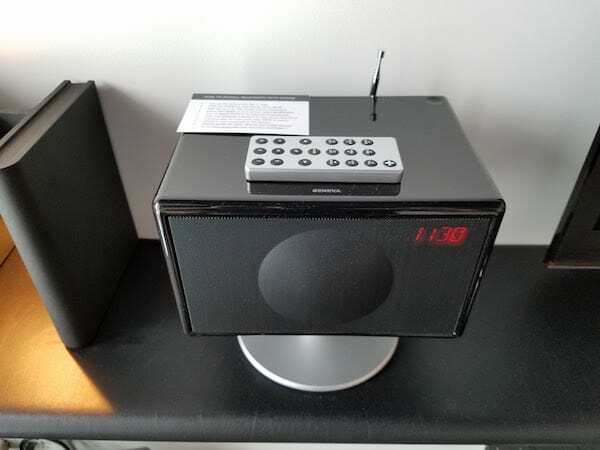 A nice audio sound system (with instructions on how to connect your phone) was welcomed. 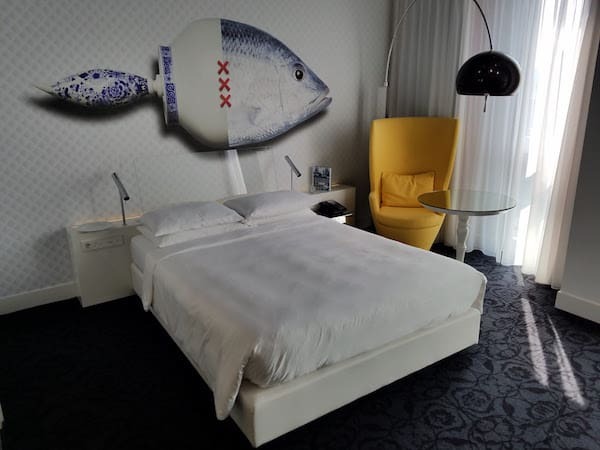 There were quite a few quirky details like a pair of clogs mounted to one wall, a fish print behind the bed, plates glued to the shelves. They tried to keep the library theme going in the rooms. 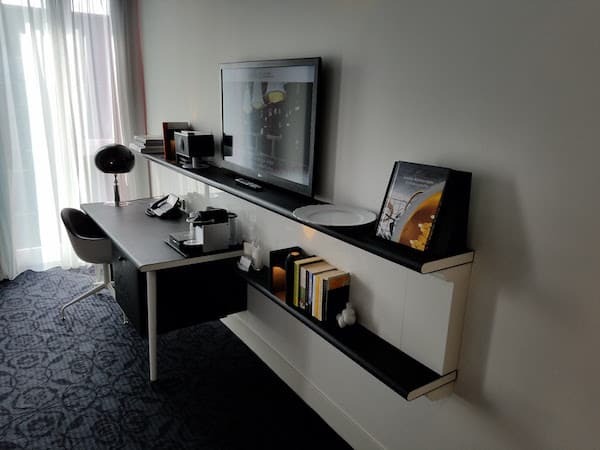 Like other Andaz properties, the Andaz Amsterdam Prinsengracht offers in room mini-bar that is free (except the alcohol). 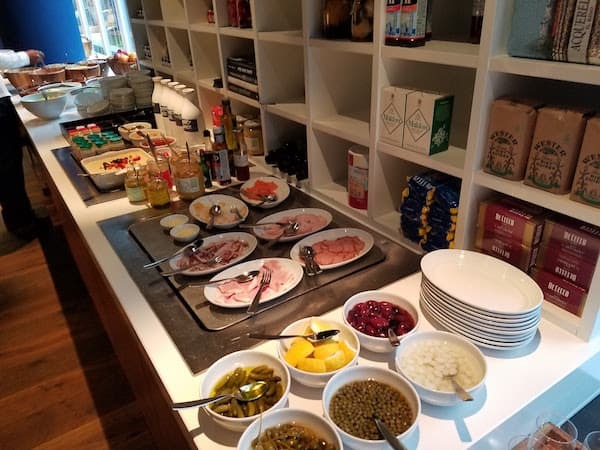 The bar included cans of soda, bottles of juice and water, a candy bar, crackers and nuts. Nothing too thrilling but it does get refilled each day. I mostly made use of the water but also made use of the snacks when I got the munchies. 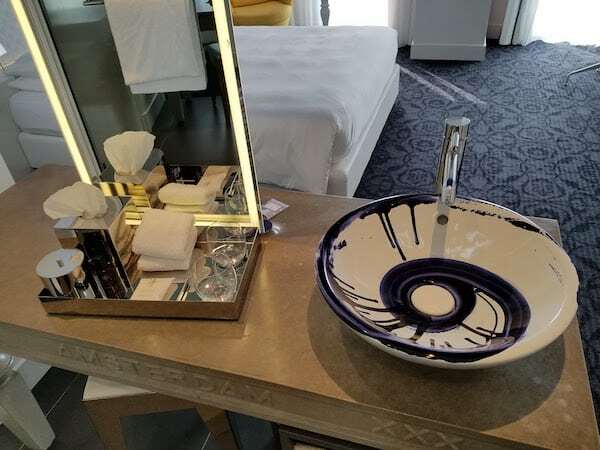 The Bathroom: There is not a separate bathroom in the rooms at Andaz Amsterdam Prinsengracht. 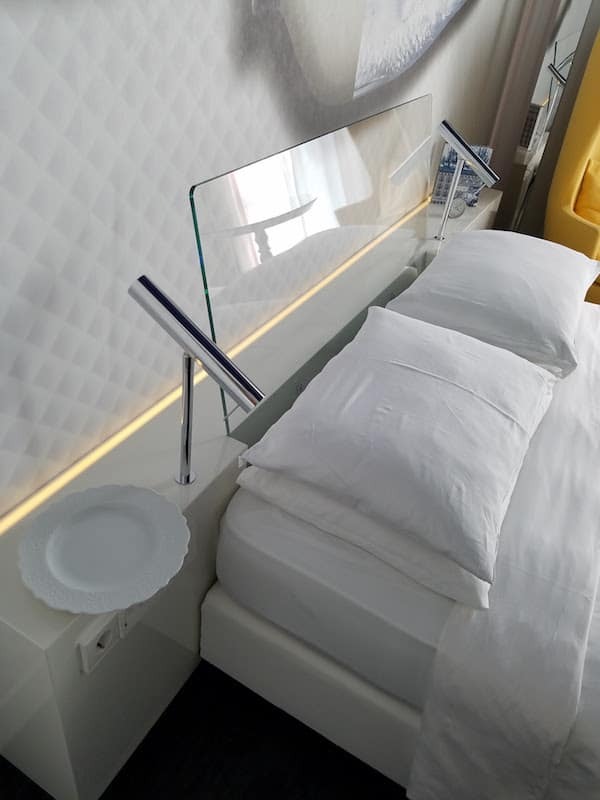 The room is fully open concept which means you better be traveling with someone you are very comfortable with. There is a counter that spacially separates the bathroom from the living room. 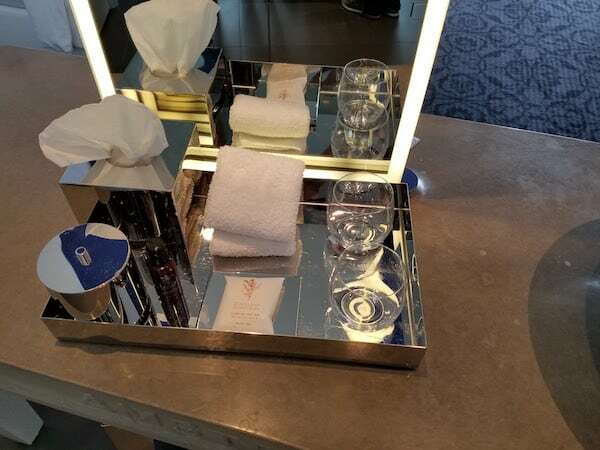 On the counter/table is a double sided, lighted mirror and a sink. 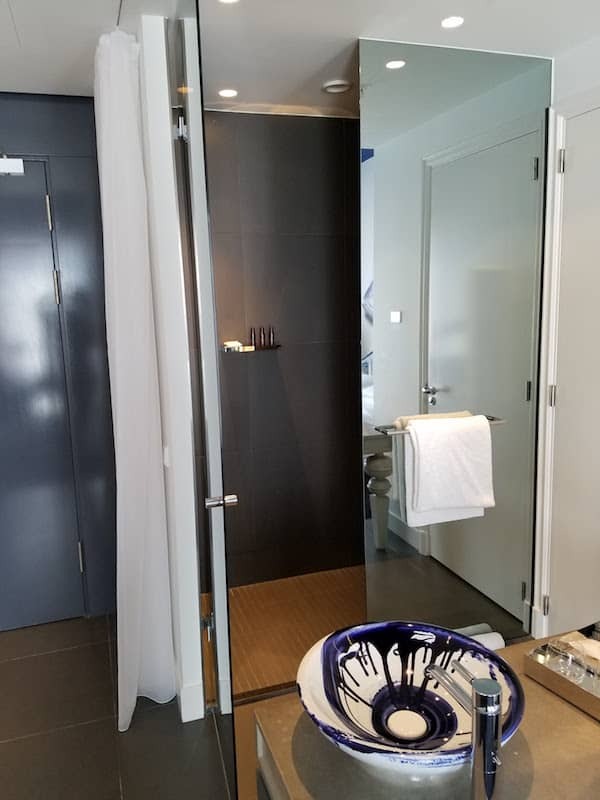 The shower is built in to one of the walls and is made of one way mirror; you can see out when you are in the shower but others can’t see in. There is a rain shower head as well as a wand shower head but you can only have one or the other on at a time. 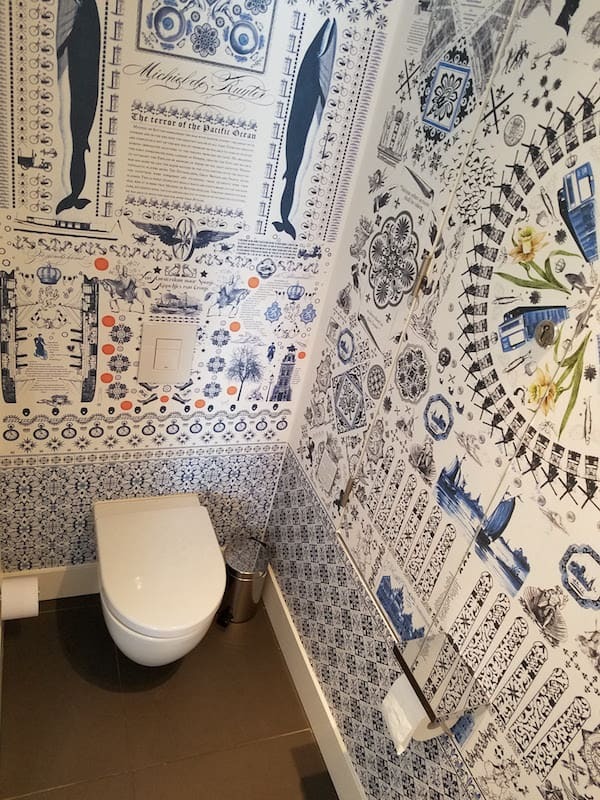 The toilet is in a separate closet with very cool wallpaper with all sorts of information about Amsterdam for good toilet reading. 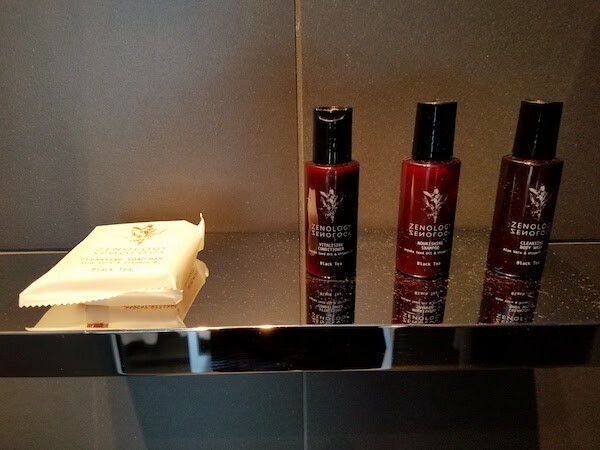 The bath products are Zenology which I found to be nice (and apparently it is quite high end). As I said, there really is no privacy. 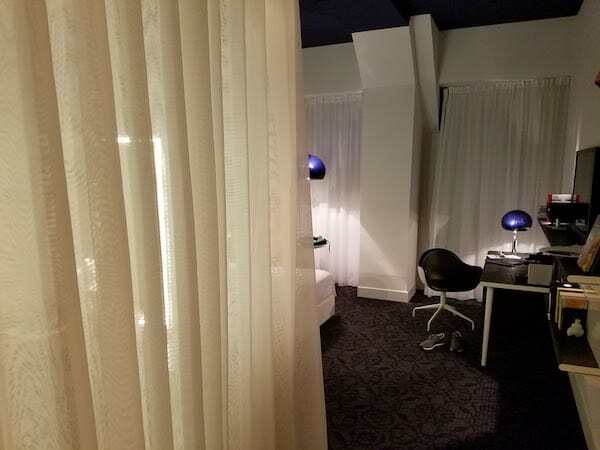 There is a small, see through curtain that can be pulled but it only blocks views from the door, not from the rest of the room. 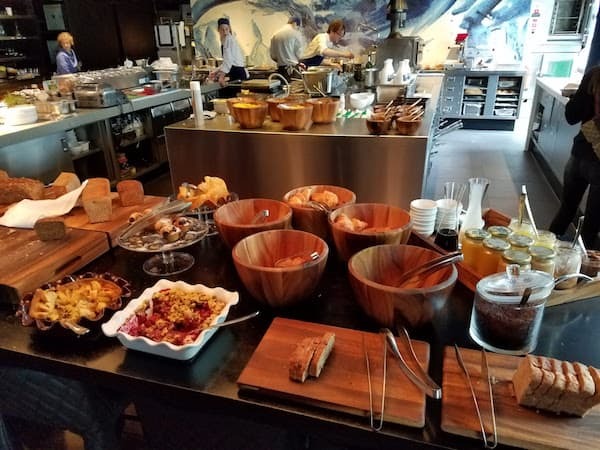 Restaurant: The onsite restaurant at the Andaz Amsterdam Prinsengracht is called the Bluespoon. It is open concept and the kitchen is in the middle for you to watch as your food is prepared. 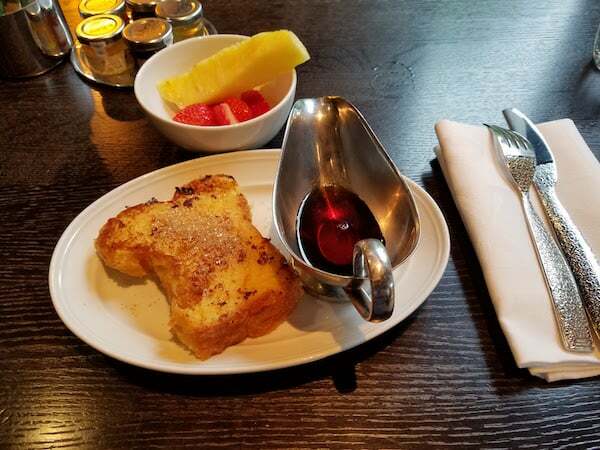 If you are a Hyatt Gold Passport Diamond Member, breakfast is included. 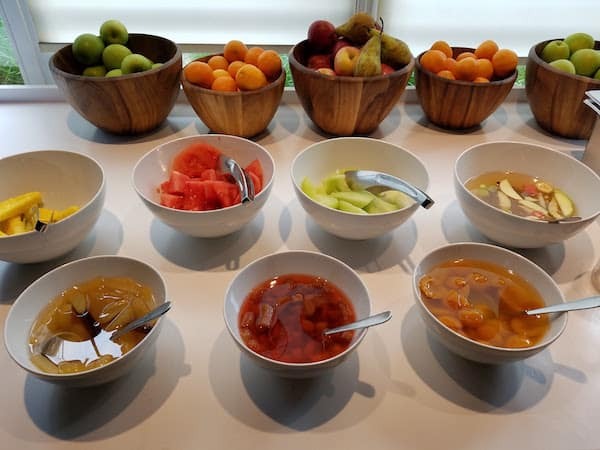 The breakfast includes a buffet as well as your choice of made to order dishes. As a Diamond, it seems like you can order as much as you want off the menu and the cost is covered. 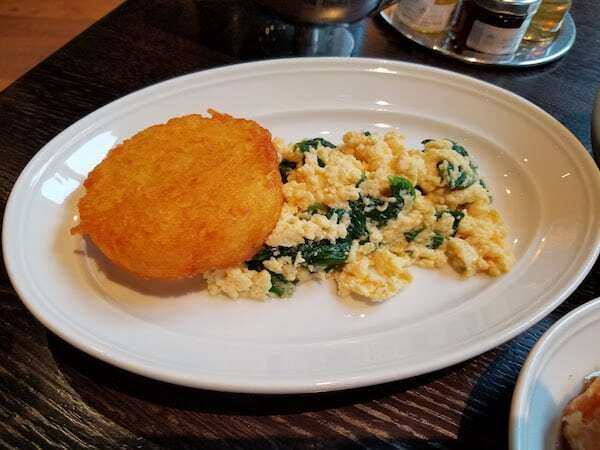 I found the food to be quite good; definitely a great value for Diamond members and better than a breakfast you will find in a Grand Club. There is also a bar off the lobby that goes by the same name. In the second building there are some function rooms for weddings and events. Spa/Gym: There is a small spa and gym in the basement, under the garden (see the glass skylight in the photo below). There is no swimming pool. 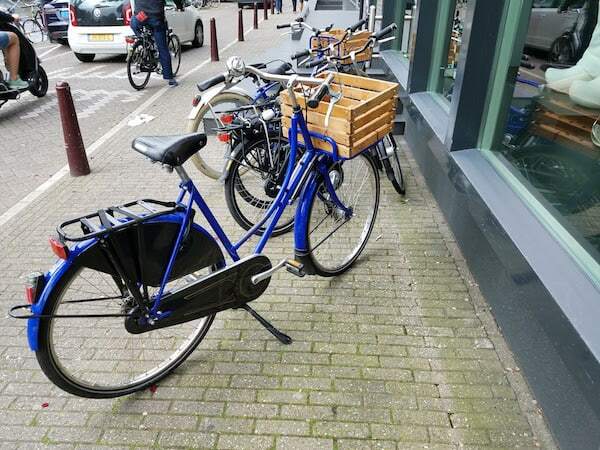 You can also borrow bikes from the hotel. There are not that many, however, and during nicer weather you may be out of luck as it is first come first serve. I was able to borrow one and had a blast riding around the city on it. They are free to borrow and have a built in lock and basket on the front. 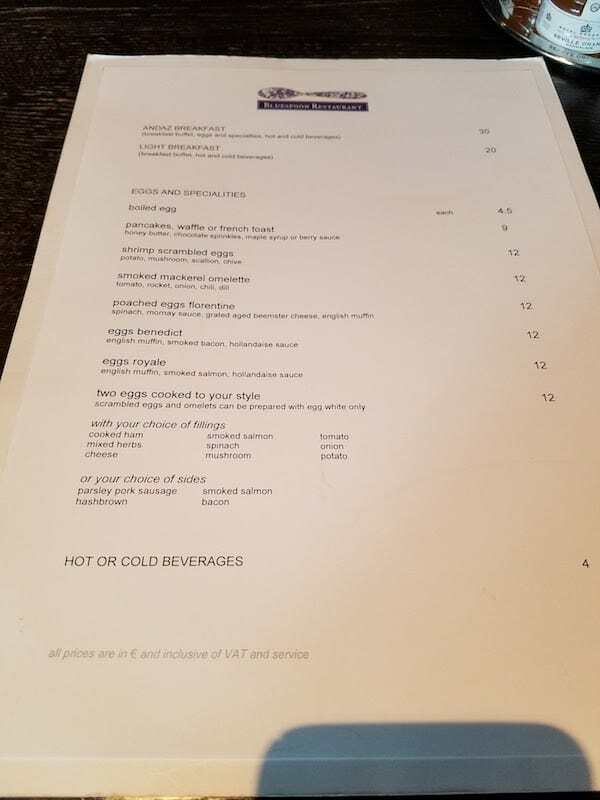 Service: The staff tries very hard but it always seemed like the property was understaffed. Whenever I need to speak with someone at the front desk I had to wait in a line for up to 10 minutes. When you had their attention they were very helpful. 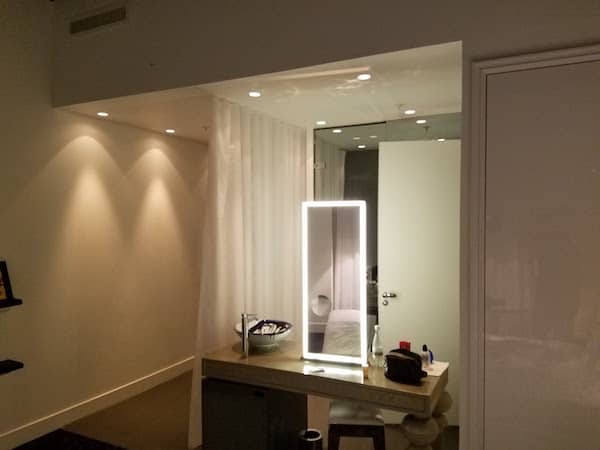 My room was serviced twice each day (cleaned as well as having the minibar refilled). 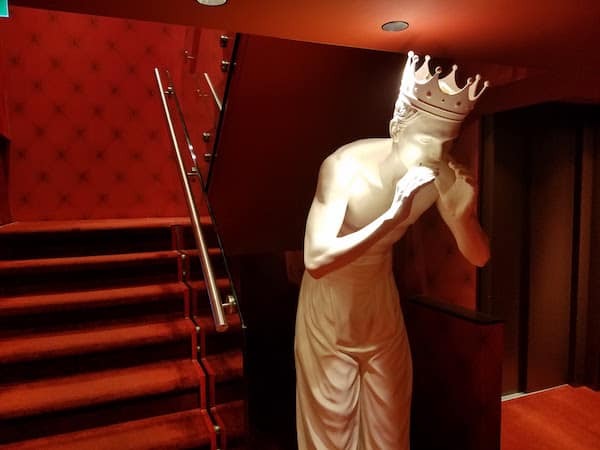 However, the times were odd for housekeeping. The first time they came was around 5:00pm and the second time was around 9:30pm for turndown service. There is no concierge but the front desk staff are very knowledgable. 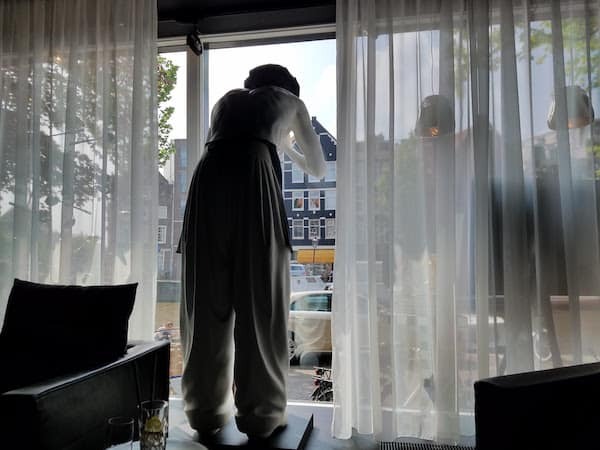 Overall: This was my first stay at an Andaz as well as my first time in Amsterdam. 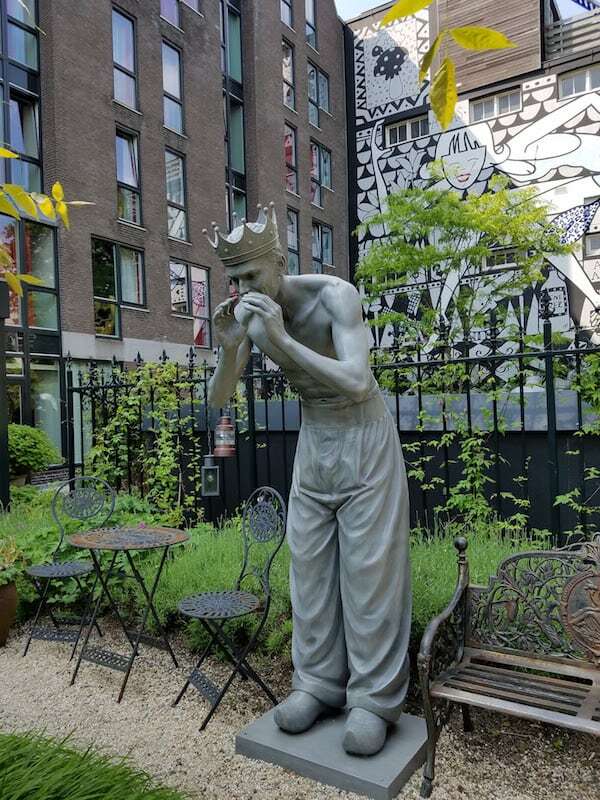 I enjoyed my time at the Andaz Amsterdam Prinsengracht. 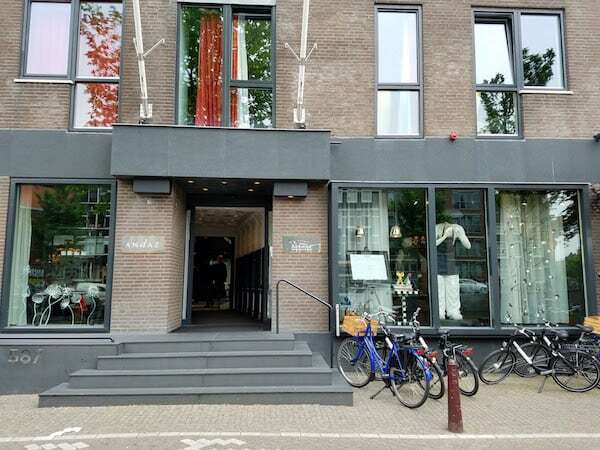 The price is extremely high; however I think that it is inline with market rate for a hotel room in Amsterdam. Don’t hold your breath to find a cash + points option for paying and if you want to pay with points, plan well in advance. 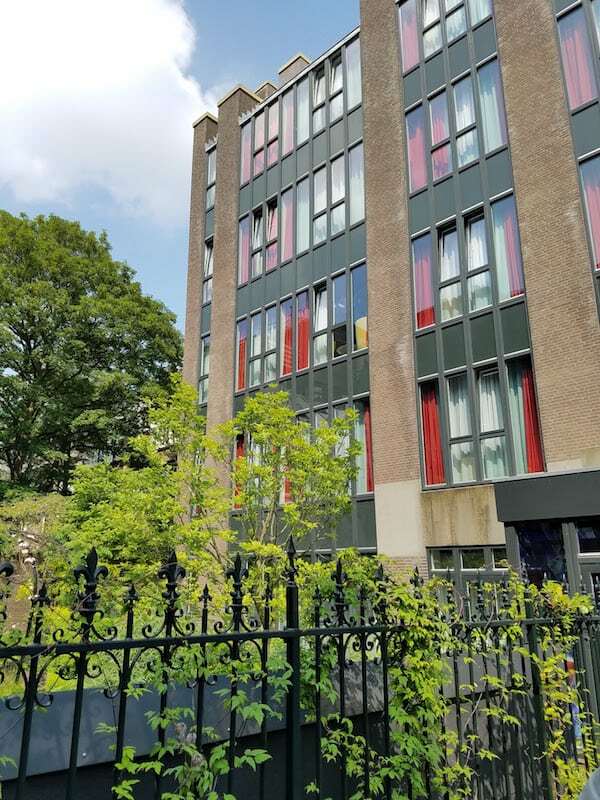 The property is in a sleepier, more residential area of town which I was very happy with; after all you can get to any part of town in about 10 minutes by bike or 30 minutes walking. 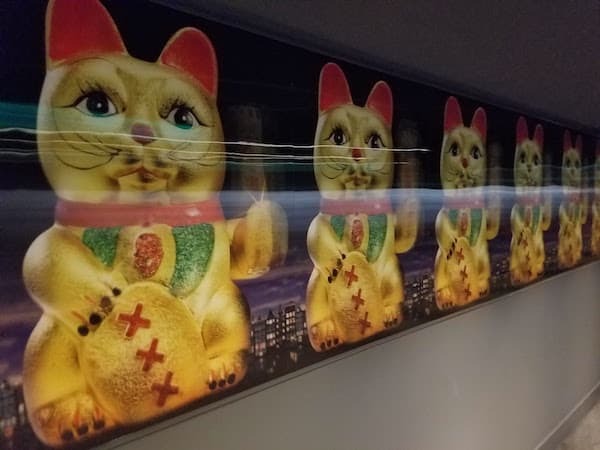 The room is funky and I’m sure some people would not like the bright colors and odd artwork, but I found it quite fun.